Are you concerned about crimes in your community? TEXT MESSAGE: type the code TIP190 at the beginning of your text message, and then send your message to 274637. 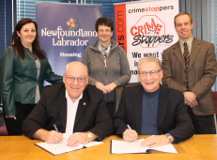 In January 2014, Newfoundland and Labrador Housing Corporation partnered with Newfoundland and Labrador Crime Stopper to encourage community involvement with the program. Crime Stoppers enables any individual who has knowledge of any crime to relay their clues or information by either submitting their tips online, calling toll free, or sending a text message (see options above). You will not be asked to give your name. Your anonymity is guaranteed and you will not have to testify in court.